Searching for a vegetarian or vegan restaurant in Amsterdam? 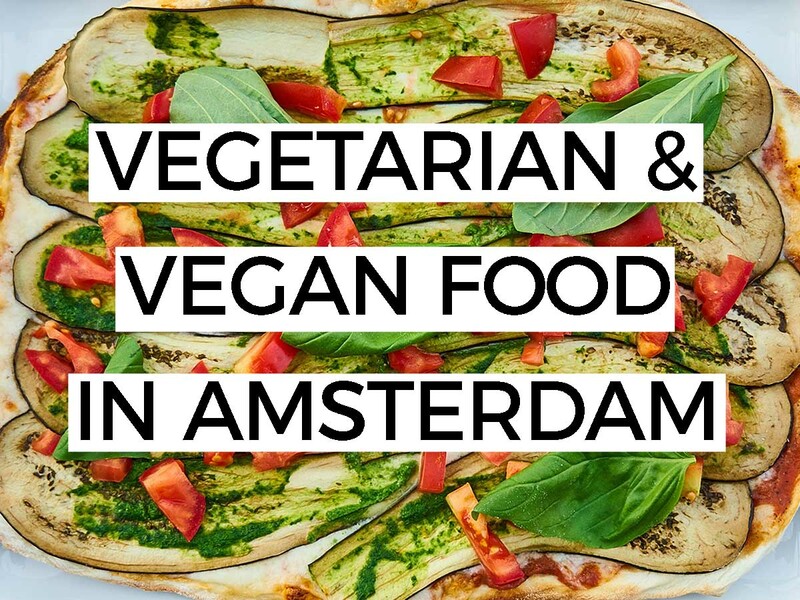 Most restaurants in Amsterdam offer some vegetarian options on their menus, but here are more than 20 spots that specialize in animal-free eats! Lekker en gezond! 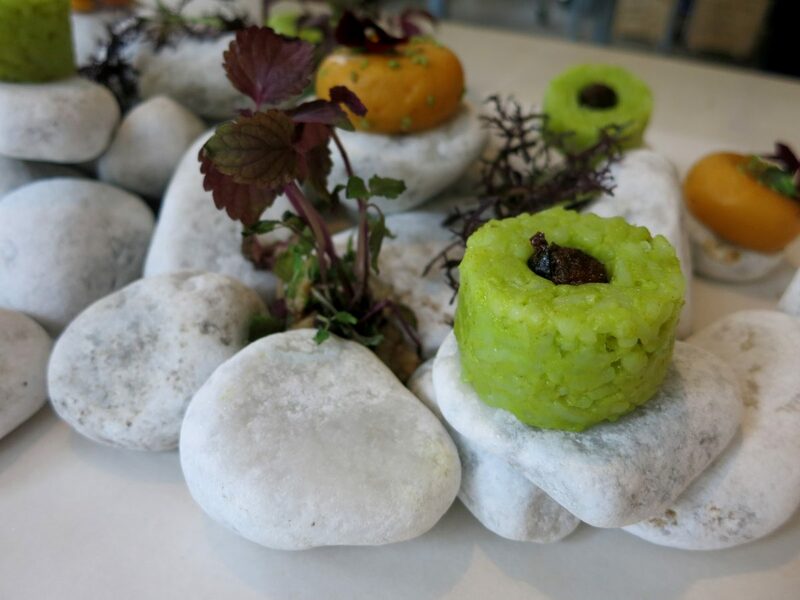 De Culinaire Werkplaats is a unique dining experience that uses only vegetables, fruits and grains to create edible works of art. The restaurant is also a contemporary food design studio. The chefs use products and suppliers that promote animal welfare, are small-scale or organic farms, are fair trade, seasonal, local, and healthy. After the meal, diners pay what they think it was worth (typically €50 or so for 3-5 courses and wine). Meals are developed around a theme, like the color red, flowers, architecture, artists or other inspirations. Check their website for information on the latest dining experience. Vegetarian fine dining, Betty’s offers a set four-course meal. All ingredients used are organic, including the wines. Awesome! The dishes range from bean soups and fresh spring rolls to a Greek feta tart and freshly baked desserts. If you do not desire the full meal you can also order a la carte, but many suggest ordering the four-course menu to enjoy the best experience. Reservations are recommended as well. If you would like to learn to cook elegant vegetarian dishes, Betty’s offers cooking courses where you can learn to cook “over Betty’s shoulder”. The restaurant also has a small shop where they sell handpicked ingredients like fine oils and chocolates. A mix of Indian, Middle Eastern and Mediterranean cuisines, Golden Temple offers a varied vegetarian menu in a unique environment. Founded by a group of Sikhs, dining at Golden Temple will leave you feeling fresh and renewed. Sit on the floor on cushions, sip delicious fresh juice “cocktails” or chai teas, and enjoy the exotic flavors. All menu items are vegetarian, many are vegan, and quite a few are also raw. 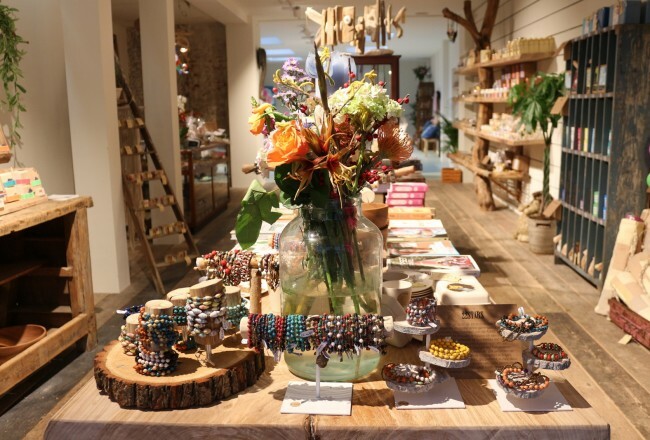 One of the original concept shops in the city, Beter en Leuk is a healthy cafe with some lovely stuff for sale in addition to art and sometimes yoga classes. The menu is vegetarian, with many vegan and gluten-free options as well. For lunch you might try one of their vegetarian or vegan soups or salads, or perhaps the pizza with cauliflower crust. On the weekend they offer additional specials including waffles with fresh fruit and oatmeal topped with fruit, hazelnuts and pumpkin seeds. And once a month on Sunday they serve a special vegan brunch. A laid back, funky cafe right in the center of Amsterdam, De Bolhoed has a simple vegetarian and vegan menu, consisting of salads, soups, sandwiches and warm meals. Many enjoy the large salad with an assortment of add-ons like veggie quiche, soup, or pita with hummus. This salad is not just a pile of soggy lettuce, but a hearty meal that often includes beans, guacamole, quinoa, bulghur, tofu and other ingredients. 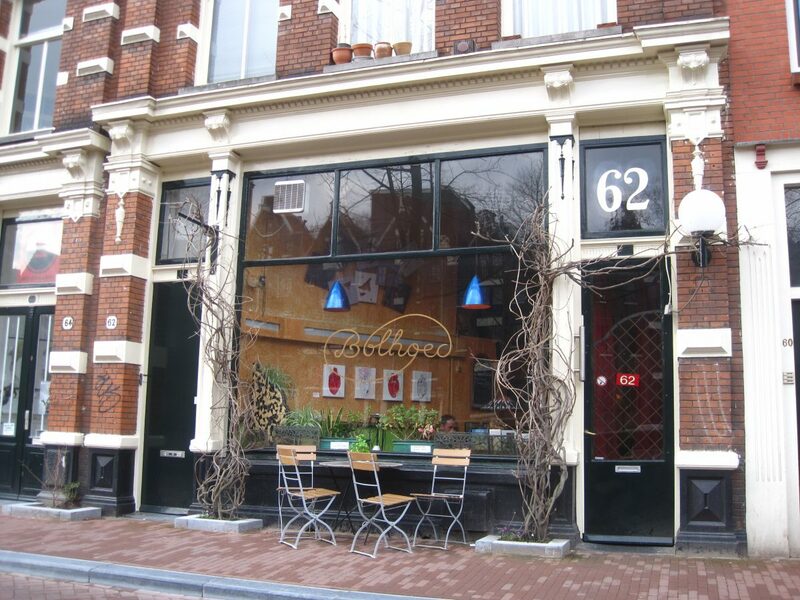 In addition to vegetarian and vegan food, De Bolhoed offers wine and beer, coffee drinks and desserts. Keep in mind that this cafe only takes cash, so stop by the ATM on your way. I first tried Spirit in Rotterdam and wished it would come a bit closer to home. And now it has! This restaurant is based around a buffet concept with a huge variety of dishes that change daily. Everything at Spirit is vegetarian and organic and many things are vegan as well. Each item has the ingredients posted so you can choose based on any food allergies or dietary restrictions you have. The dishes are international in flavor and range from spicy noodles to salads to fried snacks to comforting soups. Their desserts are very rich and tasty too. Spirit is open all day from breakfast to dinner. This quaint vegetarian restaurant decorated in red and white is located on a charming neighborhood street in De Pijp. 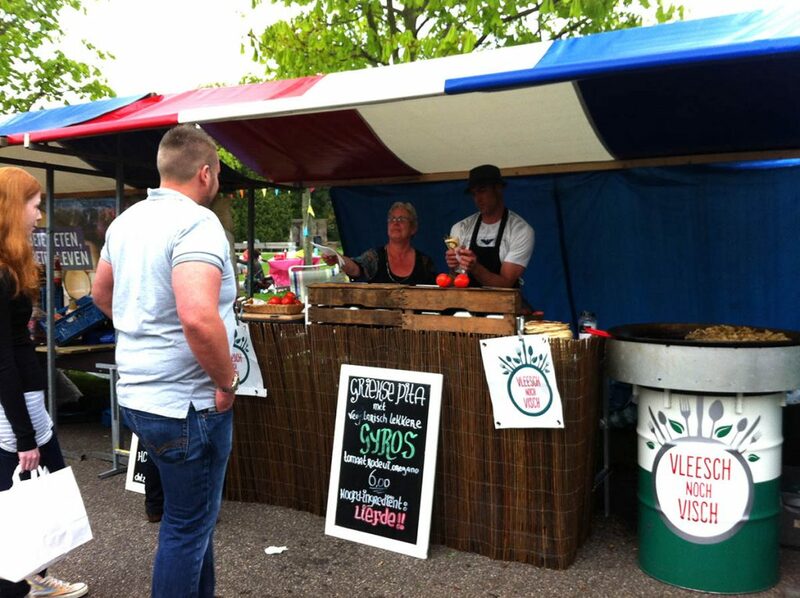 De Waaghals serves creative vegan and vegetarian food at reasonable prices. The menu varies seasonally and they try to use as many organic ingredients as possible. The space is small so reservations are recommended, especially for Friday and Saturday dinner. 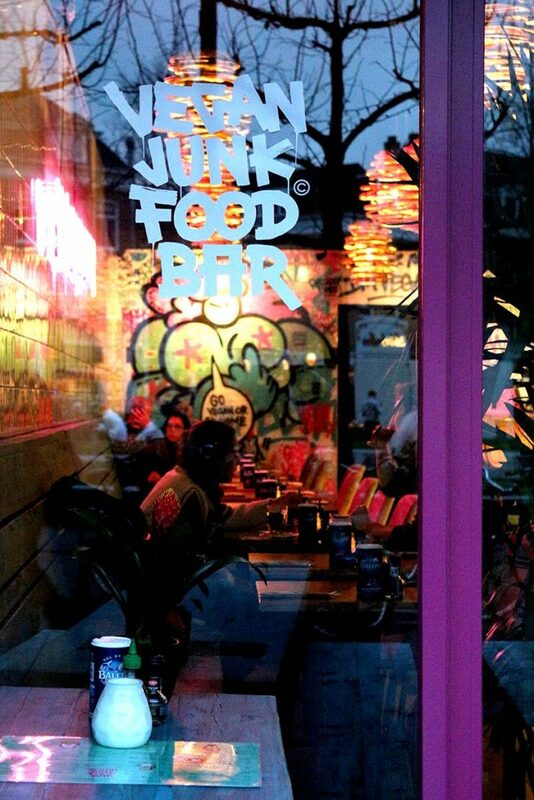 Yes, Amsterdam has a raw food restaurant! Alchemist Garden is a small cafe and shop that serves raw vegan food made with love by Alec Boswijk, the owner. Everything is raw, vegan, organic, and gluten-free. Try the pesto pasta made with zucchini noodles or the Vietnamese-style soup. Fresh-squeezed juices, nut milks, kefir, and fresh coconuts are all available to drink, or try a very reasonably priced biodynamic wine with your meal. Open from 7:00-21:00 Monday- Friday and 09:00 – 21:00 on Saturday, it is best to make a reservation in advance if possible. 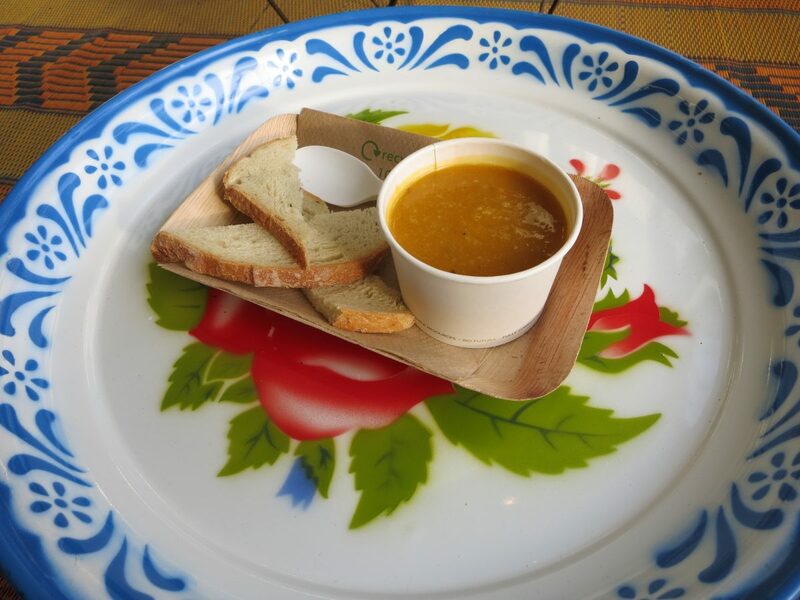 A charming dinner restaurant tucked away near Albert Cuyp, Olive&Cookie specializes in slow food style vegetarian dishes influenced by the regional cooking of Istria. 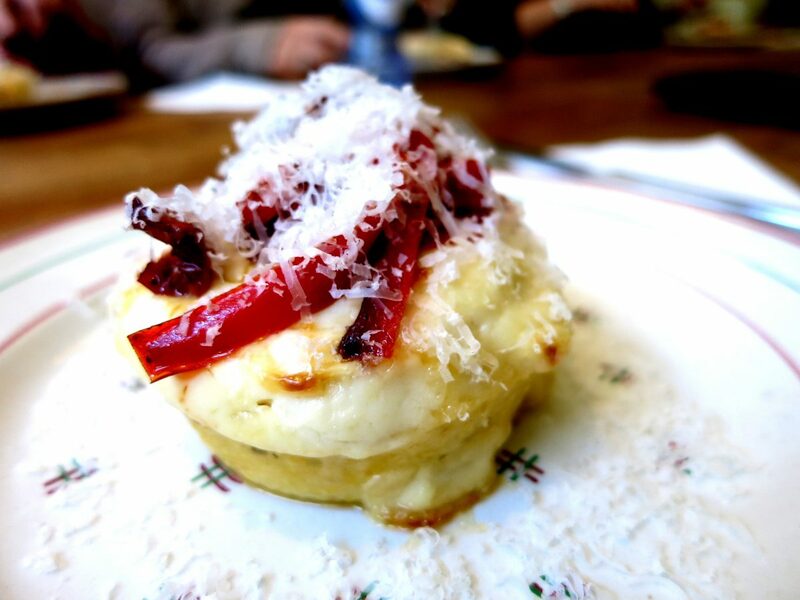 Just like Grandma would make, if she was an Istrian vegetarian! The food here may be vegetarian but it is rich and flavorful. Just one bite of their chocolate tart will remove any feelings of deprivation you may have. Only open Monday-Friday from 16:00-21:00, Olive&Cookie has food for take away or stay and eat in their small, cozy space. A store and lunchroom near Westerpark, DopHert has vegan sandwiches, salads, soups and more to eat there or take away. Come by in the morning for soya yogurt with fruit and granola, or brunch with tofu scramble on the weekends. DopHert also offers catering, special events and workshops, check their website for info. Le Sud serves healthy Mediterranean and Middle Eastern vegetarian salads (some with fish). 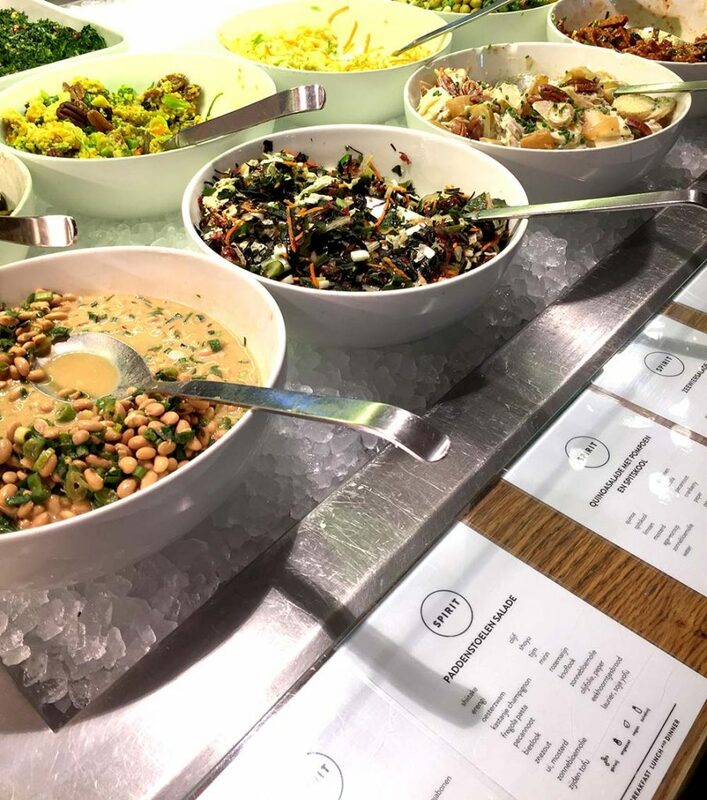 Priced by the weight, ranging from around €1-3 per 100 grams, the salads are fresh and tasty, using more than 50 types of herbs and spices. Try the hummus, herbed pumpkin salad or the borani, a Persian eggplant salad. Order it spread on bread or eat it plain. Both locations are convenient to Westerpark, so why not grab some salads and some Turkish flatbread and enjoy a picnic in the park? A newly opened vegan and vegetarian deli and shop in de 9 straatjes area, Vegabond sells superfoods, vegan foods like soy cheez, gluten-free foods and prepared meals to eat there or take away! Smoothies, vegan sandwiches, vegan cupcakes and more! Yum! The shop is brand new and lovely inside, located on one of the prettiest little canals in Amsterdam. They don’t advertise it, but Cafe de Ceuvel serves a completely vegetarian menu. In addition, they strive for sustainability in everything they do. This cafe and associated project are a must-visit, if not for the fascinating design experiment, then definitely for the laid back vibe along the waterside in Noord. De Peper is a vegan, organic cafe run as part of a collective called OT301. If you’d like to dine here, call (020) 412 2954 between 16:00-18:30 on the day you plan to visit so that you can be sure they have a meal for you. De Peper is open on Tuesday and Thursday-Sunday, and dinner is served between 19:00-20:30. When you arrive, pay for your meal with the server and your name will be called as the courses are ready. There is no table service, so you bus your dishes yourself. Prices are on a sliding scale, you pay however much you are able, usually between €6-10 for soup and a main course. They also have desserts and beer! Lavinia is a cute brunch and lunchroom with two locations, in the city center and Zuid, where most of the items are vegan or vegetarian. You can order banana pancakes, quinoa porridge, nice sandwich on spelt bread or choose a salads from the deli case. Their dishes are healthy while also being very filling and hearty with lots of beans, whole grains and nuts. Finish off with a sweet treat and a coffee or tea. 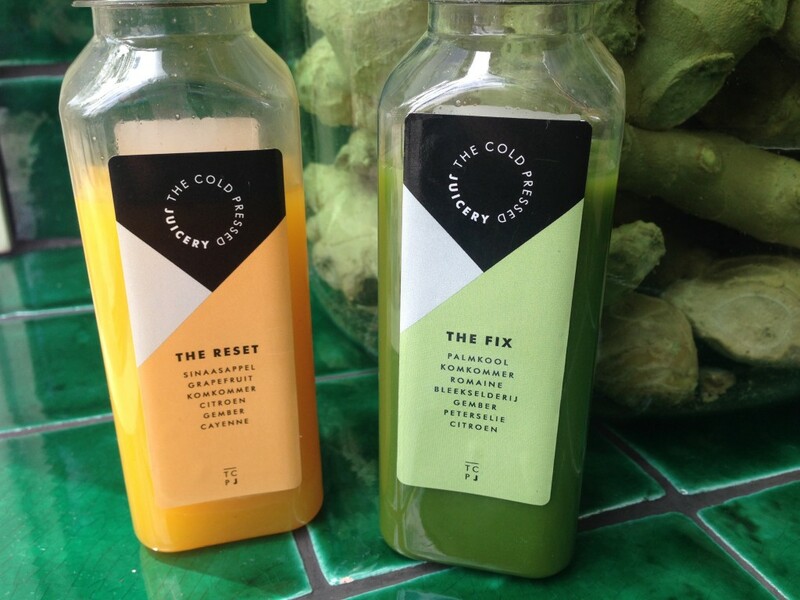 Raw, organic, cold pressed juices and smoothies are the thing here. It’s the land of the free: dairy free, gluten free, preservative free. The ultimate in healthy, clean food. Go for a vitamin rich juice or try one of their smoothies, smoothie bowls, teas, raw food wraps or vegan soups. They even have healthy sweet treats. Everything is organic at Juice Brothers. With five locations in Amsterdam and two in NYC, this juice bar was started by four friends with a passion for quality cold pressed juice full of vitamins and minerals. They also offer acai bowls, smoothie bowls and other treats. 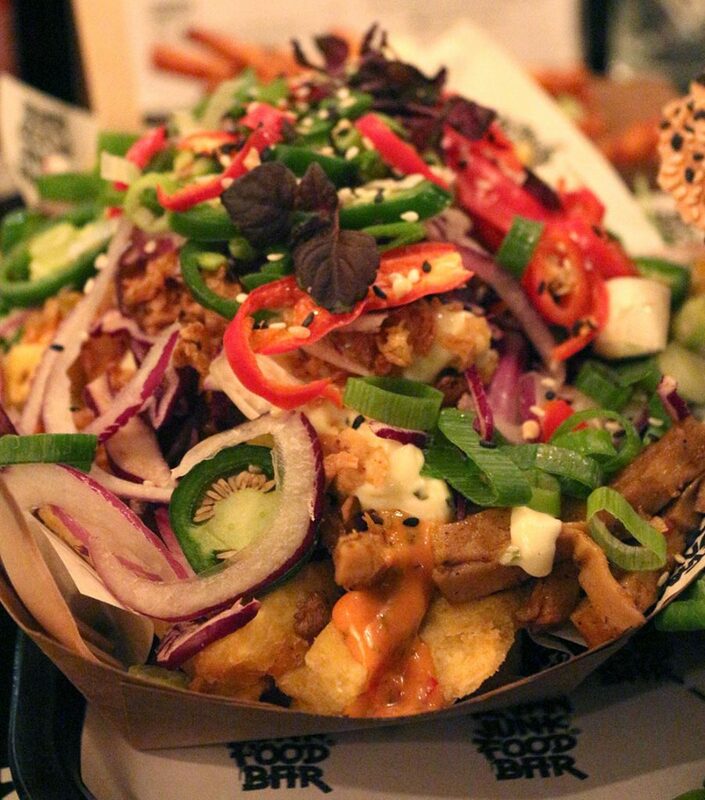 Does vegetarian street food sound like it would hit the spot? Then look for the stand of Vleesch Noch Visch at the Sunday Market and Pure Markt. 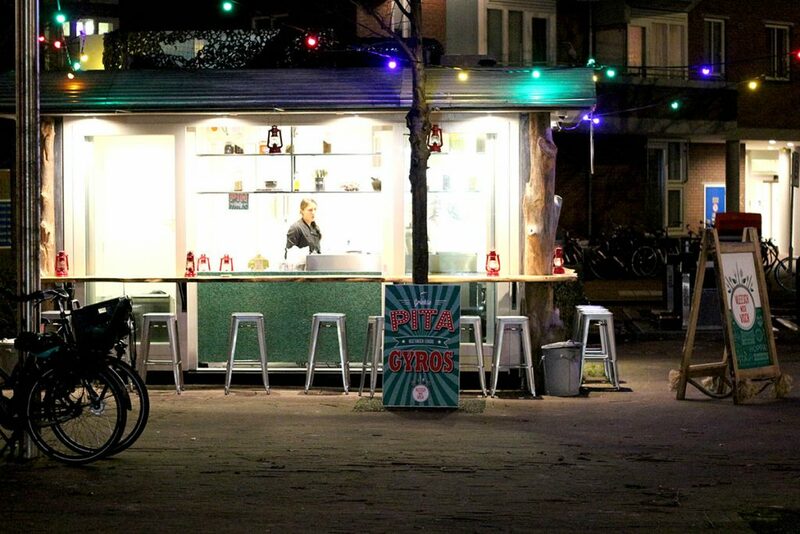 You’ll also find them just off of Van Hallstraat near Westerpark serving up tasty pita wraps, salads and soups every day. Flavors range from Greek to Indian influences but rest assured your tummy will be satisfied. Craving kapsalon, nuggets or even a burger but you don’t eat meat? Never fear, Vegan Junk Food is here. Stop in to this snackbar and go for the above mentioned treats, everything is vegan. The kapsalon is called “loaded fries” and may even be better than the meaty version you’ll find at a typical place. They also have Professor Grunschnabel vegan ice cream. What’s more, they now have two locations! At Marie Heinekenplein you can be served at your table while Staringplein is more of a typical snackbar with high stools. And a spot in the Dapperbuurt in Oost is opening soon! MKZ (Miltvuur Keuken Zuid) is a vegan self-service restaurant run by volunteers open Tuesday, Thursday and Friday. It is not only a place to eat, but also a place to meet and have discussions. The space is located in a legalized squat called the Binnenpret, which houses political, artistic and cultural initiatives. At MKZ there is no table service, you get your own food and bus your own dishes. You can also volunteer to help with the cooking and cleaning! It’s late in the evening and you’ve had a few drinks without any food in your belly. Maybe your friends are suggesting a stop by FEBO or McD’s. 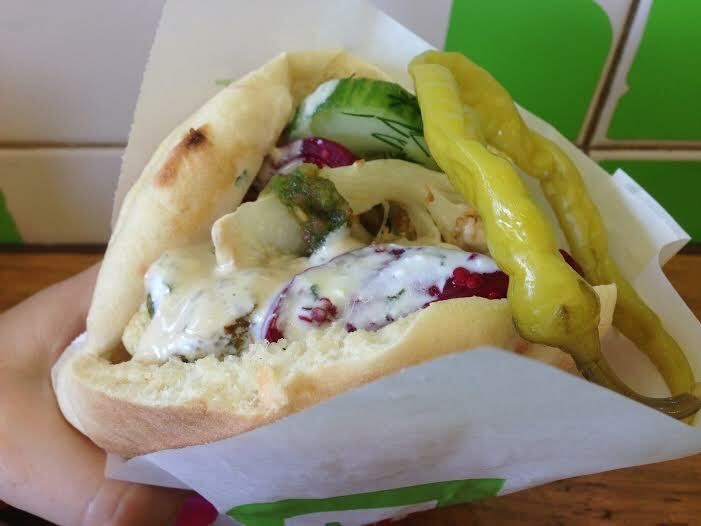 For a quick veggie bite late at night, head to Maoz instead. Conveniently located near all the tourist spots, this chain offers the standard falafel with the inclusion of an all-you-can-eat salad bar for a reasonable price. Are you looking for a place to grab a fresh juice or smoothie, or maybe a healthy salad? 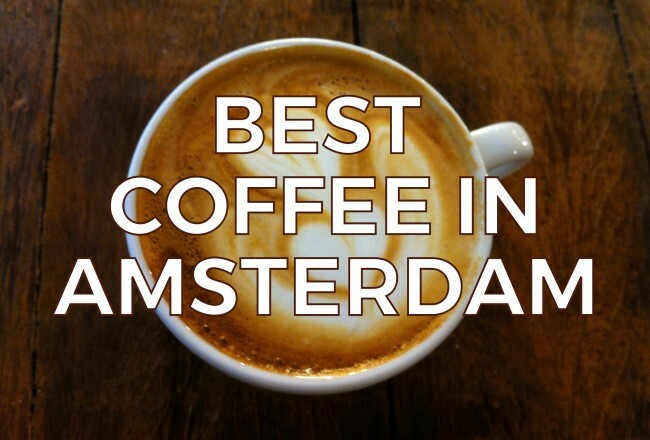 Check out our list of favorite juice bars in Amsterdam! Many of these spots have a great selection of vegetarian and vegan foods in addition to fresh healthy drinks. Try Dr. Blend, SLA and Venkel for fresh juices, salads and soups. Are you a fan of veggie burgers? Take a look at the list of our favorite veggie burgers in Amsterdam. Here’s something a little extra for you! 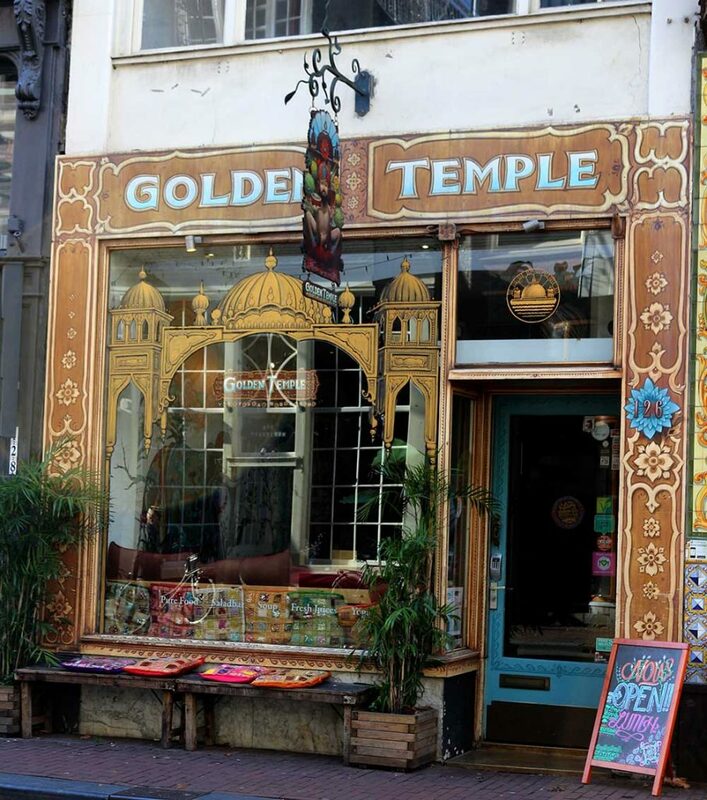 Check out these terrific vegetarian-friendly shops and event spaces in Amsterdam! Also be sure to check out our list of healthy food hotspots and places to buy biological groceries in Amsterdam. Go shopping for animal-friendly clothing, shoes, wallets, bags and more for both males and females at Vega-Life in the center of Amsterdam. 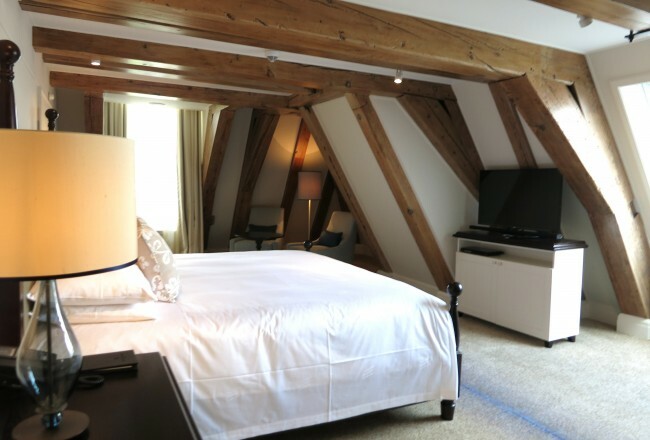 Or take a look at the online offerings if you can’t make it to Amsterdam today. The selection is broad and includes trendy items as well as more conservative styles. They also carry other things like vegan pet food and vegan personal care products. Stop in and take a look! Unlimited Health is a yoga center but also has quite a large shop with all kinds of superfoods, vegan products and accessories like cookbooks, blenders and juicers. Check out their assortment online or drop by the store to take a look in person. On weekdays at lunchtime they have fresh rawfood salads and smoothies. 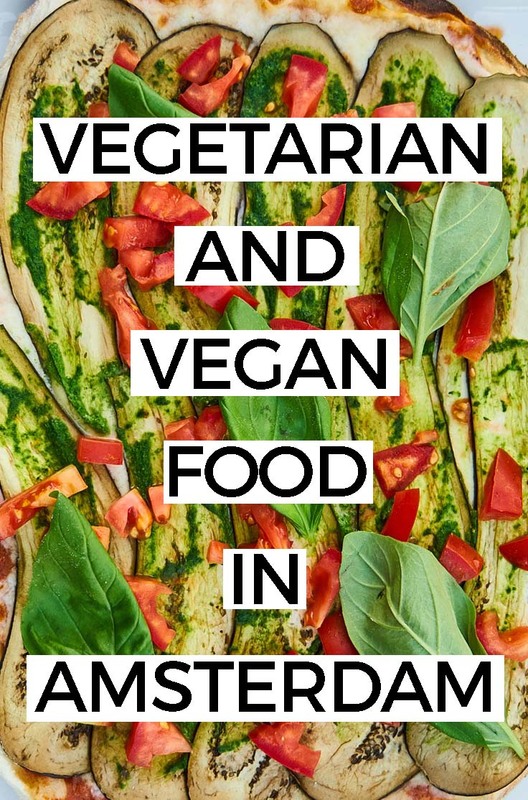 Is there a vegan or vegetarian place in Amsterdam that you love? Please let us know about it!